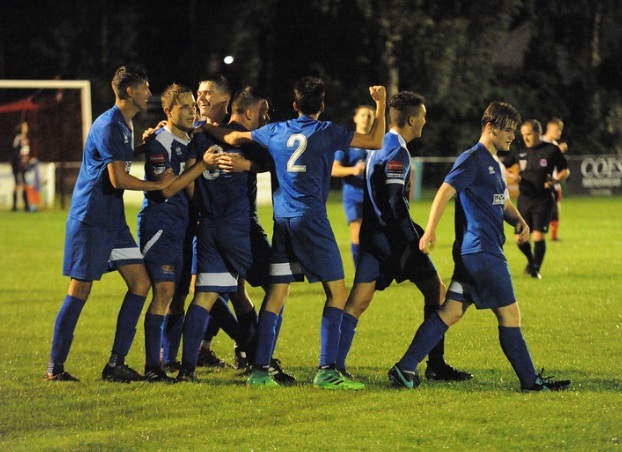 Bury Town Under-18s ran out 5-1 comfortable winners over their Brantham Athletic counterparts, thanks to a fantastic performance from the Young Blues as Drew Kendall reports from the Denny Bros Stadium. Bury started on fire from the very start, Josh Revell feeding Charlie Cook from about 30-yards out to fire a screamer over the keeper and into the roof of the net after just 10 seconds. Four minutes in Brantham had their first shot at goal, No.11 through down the right in the box whose low shot towards the far corner was easy for Reynolds to gather. Brantham then had another effort a minute later, No.3 volleying over from inside the box. Again, Brantham, went for goal on 6 minutes as No.9 shot low and tame from outside the box with the ball going straight to Reynolds. Fifteen minutes in, Charlie Cook had another attempt at goal, as his curler from the right edge of the box was heading for the top near corner had a defender not deflected it behind for a corner. The Blues then went close again two minutes later, a lobbed effort from the right edge of the box went not far over the bar. Brantham’s No.9 was then set through down the right in the box after 18 minutes forcing Reynolds to race off his line and dive down to save the low effort towards the far corner, with Gunn on hand to make sure and clear the danger. Josh Revell then almost doubled Bury’s advantage on 19 minutes, as his great strike from the edge of the box was certain to find the net, with the deflection taking his shot just wide off the left post. Reynolds then pulled of a superb stop to deny Brantham an equaliser on 22 minutes, after No.9 was through on the left side in the box his shot towards the top corner was palmed over by the strong hand of Reynolds for a corner. From the resulting corner, however the visitors equalised a minute later as the corner in on the right was partially headed away as Owen fired the ball in from inside the box. After 26 minutes Cook went close to scoring once more, as the Blues’ MOTM fired low and just wide of the far corner from the left edge of the box. Two minutes later, Cook had another shot, this time though firing over the bar from distance. Then on 29 minutes, Cook was fed 18-yards from goal, but fired just over the top right corner. The Blues man then turned provider on 31 minutes, his free-kick into the box from the left wing (just inside Brantham’s half) was headed wide at the far post. The visitors then forced a great save out off Connor Reynolds on 34 minutes, No.4’s well struck volley at goal from the edge of the box meant the Bury stopper had to dive down well to his left and palm behind for a corner. Freddie McCracken then found himself through on the left byline in the box, and picked out Revell in the middle as the Blues playmaker had his shot blocked on 37 minutes. Seconds later though Bury retook the lead, a superb cross-come-shot by Gunn on the right wing superbly found the bottom far corner. Rothon then fired a strike just wide off the near post from the edge of the box, just seconds after coming on, with 6 minutes to play before the break. Four minutes before half-time, Brantham’s free-kick was headed out to their man 20-yards from goal, who fired wide off the target. Bury though doubled their lead on 43 minutes, Josh Revell’s free-kick on the left wing fell to Ralph Slaney on the far side in the box to pick out the bottom left corner for 3-1 Bury. Brantham though whipped a cross in on the right, forcing Browne to kick away as a Brantham man running in at the far post tapped wide. That was that for the opening forty-five minutes, as the hosts went in 3-1 up at the interval. The second half began with Cook’s fantastic strike from the edge of the box being palmed away well by the visiting keeper, diving down to his right on 52 minutes. Two minutes later, the visitors then went for goal from the right edge of the box, but fired well off target of the far post. Then on 55 minutes, Reynolds made a fantastic double save, with the first seeing him off his line and save well on the left side in his own box, before the second saw him race back and gather the low shot at his left post. Three minutes later, Cook teed up Revell on the edge of the box as the latter fired over the bar. On the hour mark, Revell went for goal from 25-yards out, but fired low and wide off the left post. On 65 minutes, Revell’s cross in from the left was headed wide by a Bury man at the far post, before Bury shot low and wide of the right post a minute later. After 67 minutes, Brantham’s No.9 went for goal from six yards out on the left, but shot low and straight at Reynolds at his near post. On 69 minutes, Cook tried his luck with a free-kick on the edge of the box, but curled his set-piece just over the bar. Then on 73 minutes, Cook again tried his luck from goal from the left edge of the box, but saw his strike deflected behind for a corner. Bury then extended their advantage on 76 minutes, as the ball fell to Josh Revell on the right side in the box who fired well a great strike into the top left corner over the defender and keeper. Two minutes later, Brantham’s No.10 shot straight at Reynolds at his right post, before Bury rounded off the scoring with ten minutes left on the clock. Charlie Cook curling a 25-yard cracker into the top right corner, giving the visiting keeper no chance. On 82 minutes, Brantham won a free-kick on the right, and whipped it into the middle where the diving visiting man headed wide off the far post, which was the final chance after Charlie Cook badly injured his knee with 5 minutes left, so rather than playing a fair bit of injury time the referee blew for full-time as we all wish Cookie a speedy recovery. Goals: Cook (1’, 80’), Gunn (37‘), Slaney (43‘), Revell (76‘); Owen (23’).